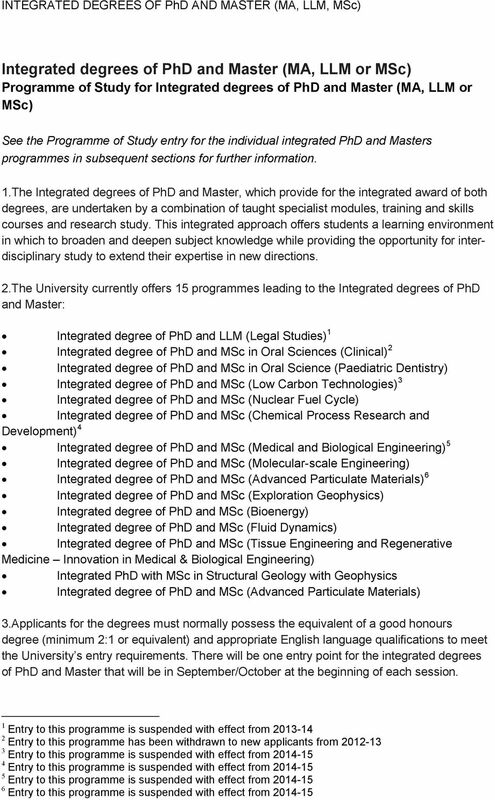 Download "Integrated degrees of PhD and Master (MA, LLM or MSc) Programme of Study for Integrated degrees of PhD and Master (MA, LLM or MSc)"
2 Programme of Study, Progress and Monitoring 4.The integrated degrees of PhD and Master are normally 4 year full-time programmes of study. 5.Progress is formally reviewed at appropriate stages and, at least annually, candidates are required to undergo a thorough review process, emphasising the different stages in the progress, development and training. The arrangements for formal reports on progress by the supervisors are described in the University Code of Practice for Research Degree Candidatures. A training plan must be in place within one month of starting the research project. 6.The relevant committee has modified the arrangements for provisional registration for the integrated degrees of PhD and Master in accordance with article 5c of Ordinance X. Candidates are accepted for study to the registration category of Postgraduate Research. 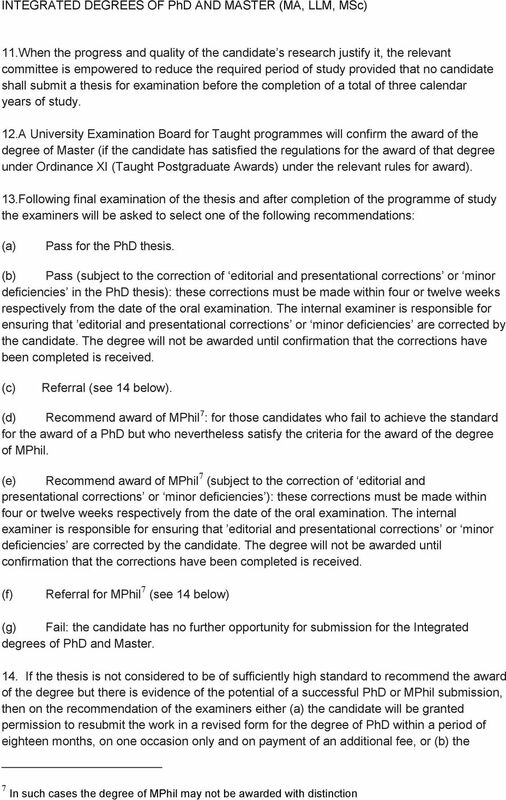 Upon completion of the first year, candidates are required to undergo a review of their academic progression, against the rules of the award as outlined in the relevant Programme of Study, to determine if transfer to Provisional PhD status is approved. If successful in transfer to Provisional PhD status, candidates will be required to undergo the formal, rigorous assessment procedure for transfer to full PhD status before the end of the second year of study. 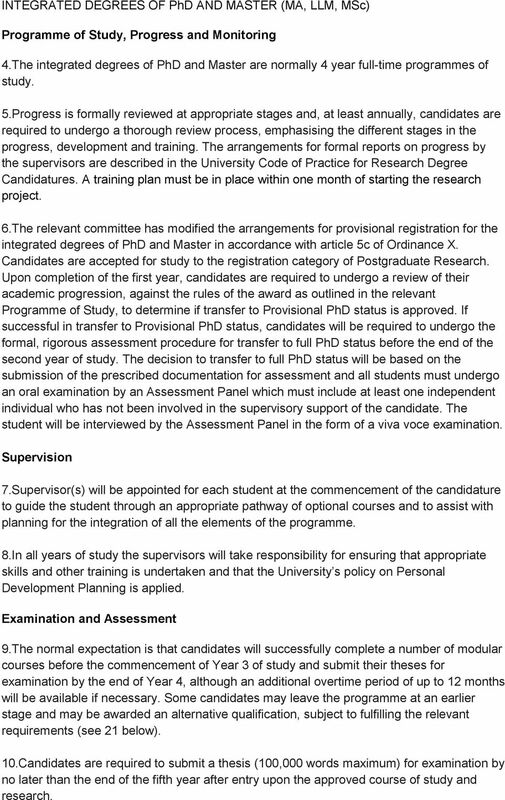 The decision to transfer to full PhD status will be based on the submission of the prescribed documentation for assessment and all students must undergo an oral examination by an Assessment Panel which must include at least one independent individual who has not been involved in the supervisory support of the candidate. The student will be interviewed by the Assessment Panel in the form of a viva voce examination. Supervision 7.Supervisor(s) will be appointed for each student at the commencement of the candidature to guide the student through an appropriate pathway of optional courses and to assist with planning for the integration of all the elements of the programme. 8.In all years of study the supervisors will take responsibility for ensuring that appropriate skills and other training is undertaken and that the University s policy on Personal Development Planning is applied. Examination and Assessment 9.The normal expectation is that candidates will successfully complete a number of modular courses before the commencement of Year 3 of study and submit their theses for examination by the end of Year 4, although an additional overtime period of up to 12 months will be available if necessary. Some candidates may leave the programme at an earlier stage and may be awarded an alternative qualification, subject to fulfilling the relevant requirements (see 21 below). 10.Candidates are required to submit a thesis (100,000 words maximum) for examination by no later than the end of the fifth year after entry upon the approved course of study and research. 5 set out in Regulation 18 of the Regulations for Ordinance X. 22. Candidates are required to pass to the required standard all compulsory courses and modules which form part of their prescribed programme of study. Exit Paths 23. 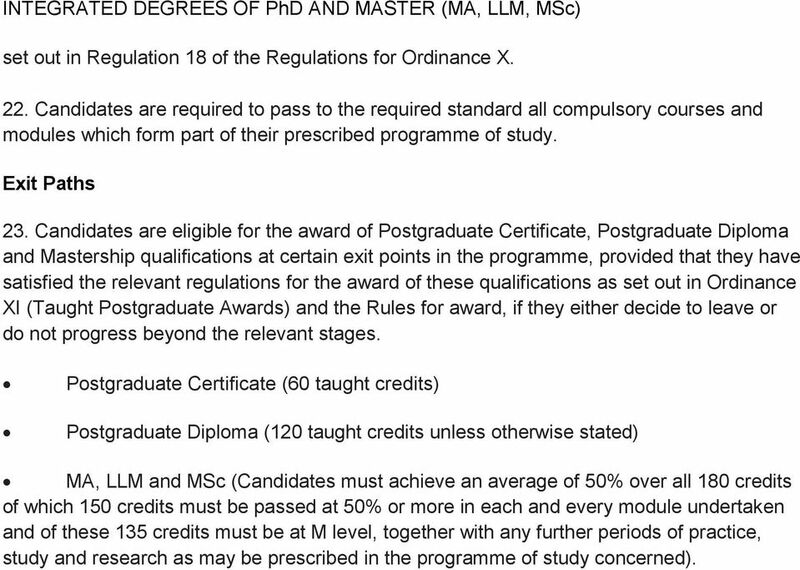 Candidates are eligible for the award of Postgraduate Certificate, Postgraduate Diploma and Mastership qualifications at certain exit points in the programme, provided that they have satisfied the relevant regulations for the award of these qualifications as set out in Ordinance XI (Taught Postgraduate Awards) and the Rules for award, if they either decide to leave or do not progress beyond the relevant stages. Postgraduate Certificate (60 taught credits) Postgraduate Diploma (120 taught credits unless otherwise stated) MA, LLM and MSc (Candidates must achieve an average of 50% over all 180 credits of which 150 credits must be passed at 50% or more in each and every module undertaken and of these 135 credits must be at M level, together with any further periods of practice, study and research as may be prescribed in the programme of study concerned). 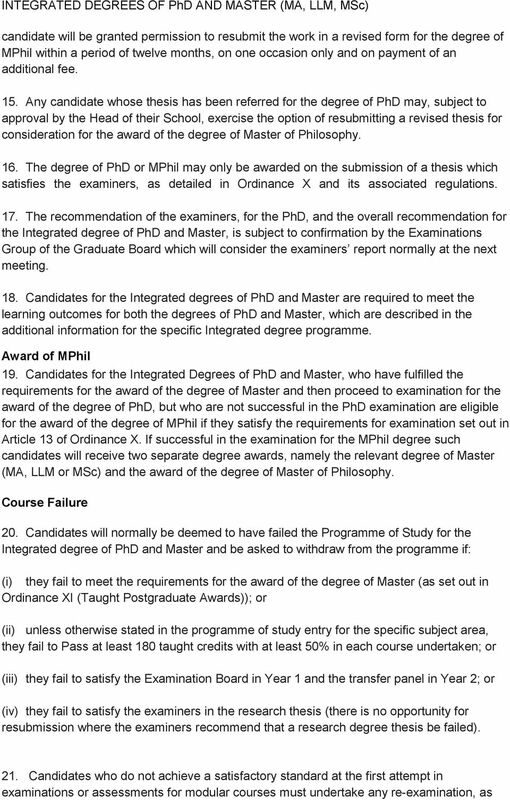 Regulations and Procedures for the award of Doctor of Philosophy by Previous Published Works.